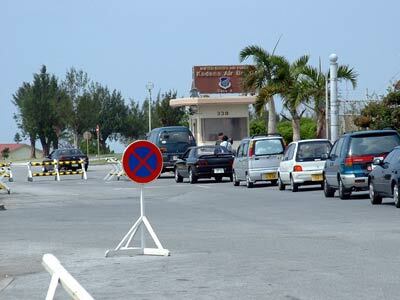 Traffic access onto Kadena Air Base, never a speedy operation, is soon to become more challenging. Construction of new visitor centers and upgrades to force protection systems requires the base to close primary vehicle gates, beginning next month. Gate 1 on Highway 58 will close in February, and remain closed 150 days through June 2005. The heavily traveled Gate 2 will close in two weeks for 304 days. Vehicle traffic is being redirected to Gates 3 and 5. The Pedestrian Gate will remain open during the November~August construction period. Other gates will experience similar construction closures and lanes reductions starting next year. Kadena officials say they’re working to minimize traffic delays by opening other gates for longer periods. Gate 5 will be open 24 hours daily beginning November 1. Next June it is slated for renovations. Gate 4 will be open round-the-clock starting in February. The Chibana Gate, which closed in July, is slated to reopen the end of this month.